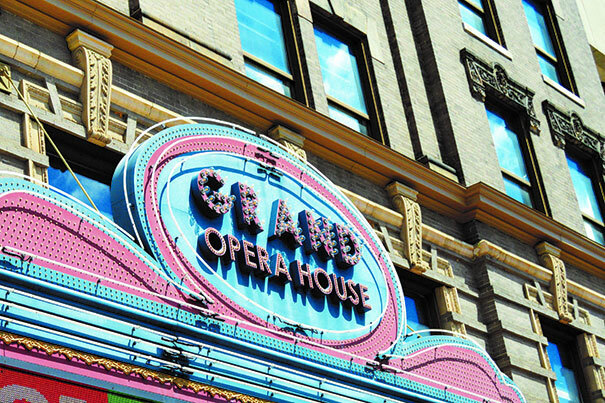 The Grand Opera House of Macon, Georgia. The touring cast of the beloved Broadway musical “Fame” will visit Macon’s Grand Opera House as part of its annual Broadway Series. Showings will be October 2-3 at 7:30 p.m.
A saxophone ensemble from Mercer University’s Townsend School of Music will also take part in the production. The quartet consisting of Brayden Hutcheson, Banks Daniels, Brian Tirado and Brandon Mincey will perform a 30-minute set before each night of the show begins. “The management of [the Grand Opera House] thought it would be very nice to promote some Mercer ensembles,” said Monty Cole, director of jazz studies at Mercer. The four students are all sophomores and came together to form the saxophone ensemble last year. Cole said this is the first time that something like this has been done at the Grand Opera House. This production of “Fame” will also include a special opportunity for four young actors and dancers. The Grand Opera House hosted a contest to give four lucky young performers the opportunity to join the cast of “Fame” on stage. The contest was open to students in high school or college, who applied by submitting a video stating “Why I Want to be in Fame.” The selected winners will join the nationally-touring group onstage at both showings, said Meagan Evans, the Grand Opera’s marketing director. Tickets range from $45-71, and can be purchased over the phone at 478-301-5470, or online at www.thegrandmacon.com. For Georgia theater and drama departments, there is a 50% off promotion for tickets using the code FAME50. For more information, visit http://www.thegrandmacon.com/event/fame-the-musical-2/.